This website is a companion website to September 11, 2001: United States and the World. There are a lot of news articles about the death of Osama bin Laden. The purpose of this website is to compile all relevant articles and multimedia in their entirety regarding the death of Osama bin Laden as both a record of the event and a record of how the news media portrays this event. As new details emerge and as the story is endlessly told, the story both evolves and solidifies, creating a new national mythos over the Death of Osama bin Laden. To best make sense of the news deluge, please use the categories on the sidebar. In post title, D2 refers to “Day 2” of the news cycle. The Secretary of State prepared remarks on U.S. strategy in the Asia-Pacific region for the conference, but later took questions from the young future officers about any topic. Though most of the evening focused on current global challenges to American foreign policy, the Secretary’s most poignant words were about the man responsible for the largest loss of life on American soil in modern history – Osama bin Laden. Clinton also shared how moved she was when she saw the spontaneous gathering of young people, mostly college students, at the gates of the White House as Obama announced Bin Laden’s death. She reflected on what that announcement meant to those constituents who lost so much on 9/11. “They could think about the future in a way they hadn’t been able to before,” Secretary Clinton told the students, smiling as she said that closure made her very pleased. ISLAMABAD, Pakistan — Osama bin Laden spent nine years on the run in Pakistan after the Sept. 11 attacks, during which time he moved among five safe houses and fathered four children, at least two of whom were born in a government hospital, his youngest wife has told Pakistani investigators. The testimony of Amal Ahmad Abdul Fateh, Bin Laden’s 30-year-old wife, offers the most detailed account yet of life on the run for the Bin Laden family in the years preceding the American commando raid in May 2011 that killed the leader of Al Qaeda at the age of 54. Her account is contained in a police report dated Jan. 19 that, as an account of that frantic period, contains manifest flaws: Ms. Fateh’s words are paraphrased by a police officer, and there is noticeably little detail about the Pakistanis who helped her husband evade his American pursuers. Nevertheless, it raises more questions about how the world’s most wanted man managed to shunt his family between cities that span the breadth of Pakistan, apparently undetected and unmolested by the otherwise formidable security services. No American was yet inside the residential part of the compound. The operatives had barely been on target for a minute, and the mission was already veering off course. Photoillustration by John Ritter. After receiving news that a team of US Navy Seals had shot dead Osama Bin Laden at a compound in northern Pakistan, President Barack Obama announced that justice had been done. The demise of the man held responsible for mass atrocities, including the 11 September 2001 attacks, was welcomed around the world. But as the US narrative developed – and changed – after the raid, there were growing questions about whether it was legal to kill the al-Qaeda leader. At one level, these have focused on what happened during the operation at the building in Abbottabad in which Bin Laden was found. “The issue here is whether what was done was an act of legitimate self-defence,” said Benjamin Ferencz, an international law specialist who served as a prosecutor during the Nuremburg trials and argued that it would have been better to capture Bin Laden and send him to court. “Killing a captive who poses no immediate threat is a crime under military law as well as all other law,” he told the BBC World Service. US Attorney General Eric Holder has led the case for the defence of the operation, which he said was a “kill or capture mission” and “obviously lawful”. “If there was the possibility of a feasible surrender, that would have occurred,” he told the BBC, adding that the protection of the Navy Seals was a priority. “One does not know what Bin Laden had there,” he said. “It’s one o’clock, two o’clock in the morning or so, it’s dark. This is a mass murderer who’s sworn to continue his attacks against the United States and its allies. WASHINGTON – Though hunted and in hiding, Osama bin Laden remained the driving force behind every recent al-Qaida terror plot, U.S. officials say, citing his private journal and other documents recovered in last week’s raid. Until Navy SEALs killed him a week ago, bin Laden dispensed chilling advice to the leaders of al-Qaida groups from Yemen to London: Hit Los Angeles, not just New York, he wrote. Target trains as well as planes. If possible, strike on significant dates, such as the Fourth of July and the upcoming 10th anniversary of the attacks of Sept. 11, 2001. Above all, he urged, kill more Americans in a single attack, to drive them from the Arab world. Bin Laden’s written words show that counterterrorist officials worldwide underestimated how key he remained to running the organization, shattering the conventional thinking that he had been reduced through isolation to being an inspirational figurehead, U.S. officials said Wednesday. His personal, handwritten journal and his massive collection of computer files show he helped plan every recent major al-Qaida threat the U.S. is aware of, including plots in Europe last year that had travelers and embassies on high alert, two officials said. So far, no new plots have been uncovered in bin Laden’s writings, but intelligence officials say it will take weeks, if not months, to go through them. They described the intelligence to The Associated Press only on condition of anonymity because they were not authorized to talk publicly about what was found in bin Laden’s hideout. 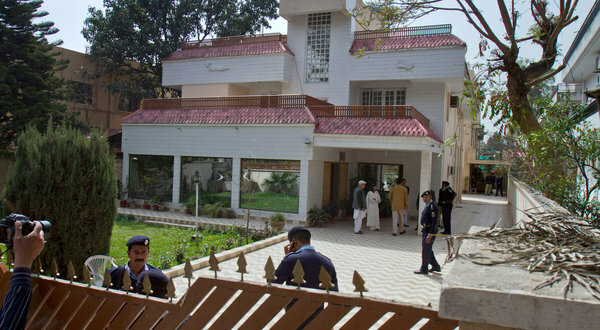 The records show bin Laden was communicating from his walled compound in Pakistan with al-Qaida’s offshoots, including the Yemen branch, which has emerged as the leading threat to the United States. U.S. officials have not shared any specific evidence yet that he was directly behind the attempted Christmas Day 2009 bombing of a Detroit-bound airliner or the nearly successful attack on cargo planes heading for Chicago and Philadelphia, but it’s now clear that they bear some of bin Laden’s hallmarks. He was well aware of U.S. counterterrorist defenses and schooled his followers how to work around them, the messages to his followers show. Don’t limit attacks to New York City, he said in his writings. Consider other areas such as Los Angeles or smaller cities. Spread out the targets. In one particularly macabre bit of mathematics, bin Laden’s writings show him musing over just how many Americans he must kill to force the U.S. to withdraw from the Arab world. He concludes that the smaller, scattered attacks since the 9/11 attacks had not been enough. He tells his disciples that only a body count of thousands, something on the scale of 9/11, would shift U.S. policy. (CNN) – Those who cheered outside the White House and Ground Zero on the night Osama bin Laden was killed may have been in the minority. When asked separately if a passage from Proverbs 24:17 – “Do not rejoice when your enemies fall” – applies to how Americans should react to the death of Osama bin Laden, 60% of Americans agreed. “There’s widespread agreement across religion and party lines about how Americans should act in the wake of the killing of Osama bin Laden,” said Robert P. Jones, president of Public Religion Research Institute, which designed and conducted the survey in partnership with Religion News Service. The survey also found “fairly big disagreement and division over the morality and the effectiveness of torture and harsh interrogation methods,” Jones said. When asked if they agreed that using torture could “never be justified” to get information from suspected terrorists, 49% of those surveyed agreed and 43% disagreed. “We’ve been watching these numbers on torture for a while now,” Jones said. “They’ve been fairly consistent for the last few years that the country is fairly evenly divided. The partisan division is really big here, and there are a few religious differences. According to the survey, 60% of Democrats agreed that torture can never be justified, while 53% of Republicans disagreed. “One thing we try to do is gauge public opinion but also gauge it in the religious context,” Jones said. To that end they also asked survey respondents if they thought God had a special role for America in human history; 51% answered yes. Asked if they believed “Osama bin Laden will be eternally punished for his sins in hell,” 65% said yes. The May 5-8 survey was conducted by telephone with 1,007 Americans age 18 and older by the Public Religion Research Institute and the Opinion Research Corporation. The overall margin of error is +/- 3 percentage points. STEVE KROFT: Mr. President, was this the most satisfying week of your Presidency? PRESIDENT BARACK OBAMA: Well, it was certainly one of the most satisfying weeks not only for my Presidency, but I think for the United States since I’ve been President. Obviously bin Laden had been not only a symbol of terrorism, but a mass murderer who’s had eluded justice for so long, and so many families who have been affected I think had given up hope. And for us to be able to definitively say, “We got the man who caused thousands of deaths here in the United States and who had been the rallying point for a violent extremist jihad around the world” was something that I think all of us were profoundly grateful to be a part of. KROFT: Was the decision to launch this attack the most difficult decision that you’ve made as Commander-In-Chief? PRESIDENT OBAMA: Certainly one. You know, every time I send young men and women into a war theatre, that’s a tough decision. And, you know, whenever you go to Walter Reed [Army Medical Center] or Bethesda [Naval Hospital] and you see the price that our young people pay to keep this country safe, that’s a tough decision. Whenever you write a letter to a family who’s lost a loved one. It’s sobering. This was a very difficult decision, in part because the evidence that we had was not absolutely conclusive. This was circumstantial evidence that he was gonna be there. Obviously it entailed enormous risk to the guys that I sent in there. But ultimately I had so much confidence in the capacity of our guys to carry out the mission that I felt that the risks were outweighed by the potential benefit of us finally getting our man.